Over the years I have published a few case studies, mostly in ASM International publications. Probably the one that has generated the most sustained interest is the one on how to teach yourself to do fracture analysis using fractures of carrots, chocolate, apples, and lollipops. 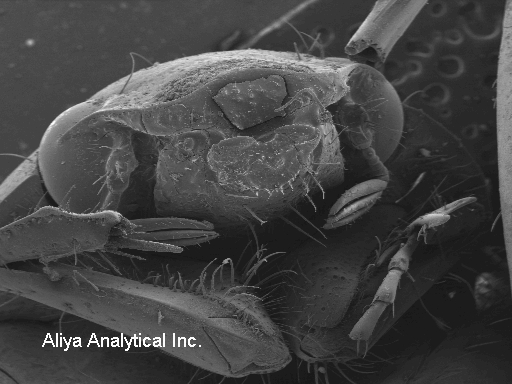 Using a scanning electron microscope (SEM), we take such fun to a new level. Rather than just using our eyes, we can expand the range of sizes of details that we can view. In metals and plastics, there are types of features that are visible only with the enhanced magnification available using the SEM, that provide information on how the materials were processed during the manufacturing operation. I won't get into those types of "micro-fractographic" features in this article. 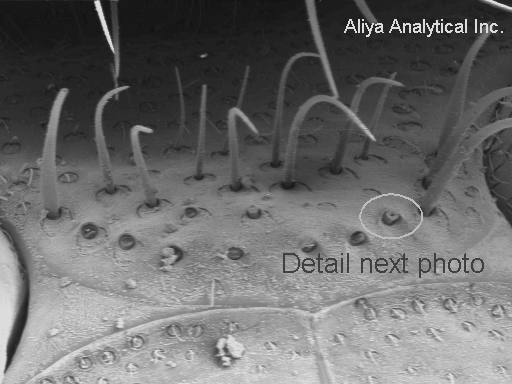 We will look at the same type of "macro-scale" features that we can see with the carrots and chocolate, but on very small things, that we could not otherwise see. To get specific, let's take a look at a Japanese beetle. Please note that although I have been known to squash live specimens found attacking my young fruit trees and roses, no beetles were killed to perform the SEM research! After the building which used to house the laboratory had a fire in 2007, I found a few (obviously long dead) desiccated beetle carcasses in an empty beaker in my window. 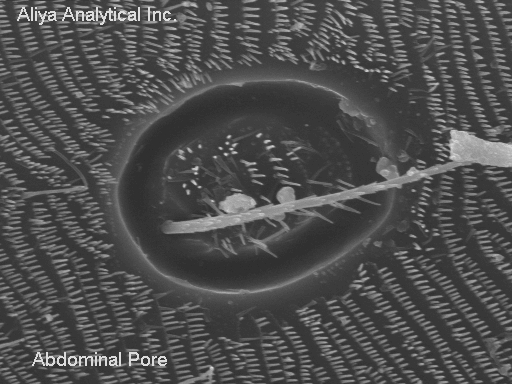 This was great practice for me to learn to use my newly acquired SEM. Here on the left is a picture of the "face." Note the hairs on the face, arms, pinchers, or whatever a properly trained zoologist would call them! Here on the right is a picture of the hairy chest! Note that one of the "chest hairs" is broken off. Note also that, at least in this dried out condition, the hair is hollow! Now, here comes the fracture analysis! The photo on the left shows the stub left when most of the "hair" broke off. The marked up photo on the right highlights the crack growth direction shown by the "chevron" patterns on the "fracture surface." There was one crack that was "deep in the screen" or closer to the back of the beetle. This is the lower of the two large arrows. Then there was a second crack that started a bit further out from the beetle's chest, growing upwards. Finally, when about one third of the hair's structure was left, a third crack initiated on the INSIDE of the hair (outer boundary of the hollow space inside the "hair") and the hair snapped off. The loading that caused this hair to break off was essentially a bending load. One person that I showed the image to said "I think that was a TORSIONAL (twisting) fracture, not a bending fracture!" Now it is true that torsional loads in cylinders can create fractures that are essentially flat and perpendicular to the length of the cylinder, as we see here. However, flat torsional fractures in cylinders are accomplished by a ductile shear process. This fracture does not show much indication of deformation. HOWEVER, to give the benefit of the doubt to my "twisted" colleague, sometimes the deformation is very difficult to detect. HOWEVER, to my benefit, how the heck could anyone TWIST one of these hairs? 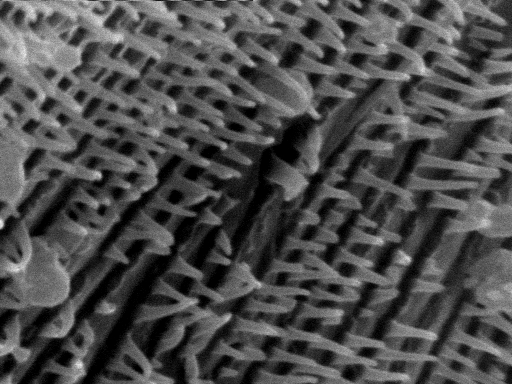 So, all in all, I still THINK that this crack was mainly created by (minuscule) bending loads, but without doing a more detailed study of microfracture features of Japanese beetle "hairs" made in KNOWN loading conditions, I can't prove it! If the hair was broken off when the beetle was moved from the beaker to the microscope, it could well have sustained some complex loading states. Well, since we are looking at this beetle, let's take a look at another interesting feature. Many insects breathe through pores in their abdomens, not through their "mouths." Here is a close up of one of these pores. Note that a hair, perhaps somewhat similar to the one from the chest, pokes out of the center of the pore. The pore is surrounded by a different type of flattened protruding features. These "flat" hairs cover large areas of the lower abdomen of the beetle. As my machine shop's employee noted, with these techniques, we can see the hair in a beetle's nose! One more useful feature available on many scanning electron microscopes is an EDS microchemical analyzer. This is an instrument that can determine the atomic elements present in very small things. 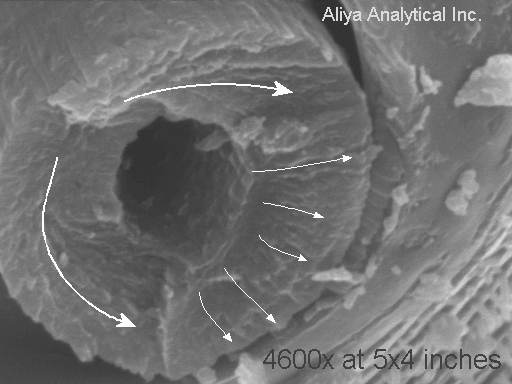 A portion of the beetle's face was analyzed, and the result is shown below. Please note that except in some specialized SEM's, the specimen must be electrically conductive. Most previously living things don't fall into this category. So in order to render the specimen electrically conductive, I sputter coated a thin layer of palladium (Pd) onto the beetle. We can see that the beetle skin is made of mostly carbon and oxygen. This is not a surprise. Most life forms are heavy on CARBOHYDRATES. We can't see (detect) hydrogen with the EDS method. But we see the carbon and oxygen that are major elements of life. 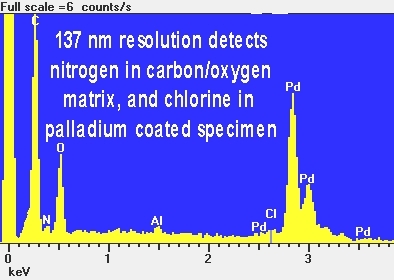 We can also see a small amount of nitrogen, a type of atom found in PROTEINS. Chlorine (Cl) is a part of salt, so that trace amount is also not a surprise. Neither is the palladium I just said I put on intentionally to be able to analyze the beetle at all. I am still not sure why a beetle would have any aluminum in it. 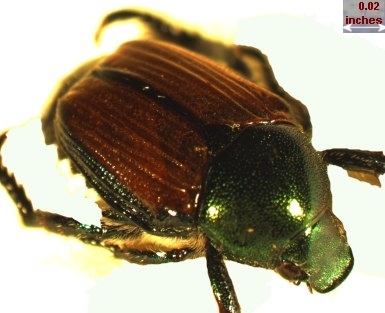 While the beetle looks shiny and metallic, it looks more coppery than aluminum. However, I suspect that the colors we see are a result of other causes than metallic elements. In any case, I have not had a chance to analyze the coppery wings! The aluminum might also not really be there. The EDS method has its limitations. In this case, in small amounts, aluminum and bromine are difficult or impossible to distinguish. The aluminum might be bromine! 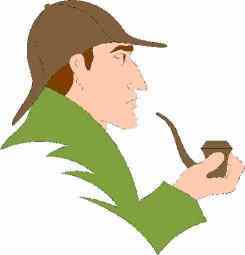 We will leave these mysteries for someone else or some other time!